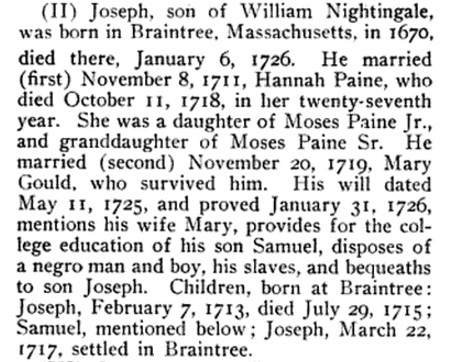 Deloraine P. Corey, Births, Marriages, and Deaths in the Town of Malden, Massachusetts 1649-1850, Cambridge: University Press, (1903) , p. 64. John S. Sargent and Aaron Sargent, Sargent Genealogy, , at https://books.google.com/books?id=jypPAAAAMAAJ . Somerville, Mass. : (1895) , p. 45. William Richard Cutter, New England Families, Genealogical and Memorial: A Record of the Achievements of Her People in the Making of Commonwealths and the Founding of a Nation, Vol. 2, , at https://books.google.com/books?id=_c4UAAAAYAAJ . New York: Lewis historical publishing company, (1914) , pp. 928-9. William Richard Cutter, New England Families, Genealogical and Memorial: A Record of the Achievements of Her People in the Making of Commonwealths and the Founding of a Nation, Vol. 2, , at https://books.google.com/books?id=_c4UAAAAYAAJ . New York: Lewis historical publishing company, (1914) , p. 929. Warren Skidmore, "The Origin of Joan Skidmore (1612?-1667) of Fairfield & Her Sister Ann Sanford of Milford, Connecticut", Occasional Papers, no. 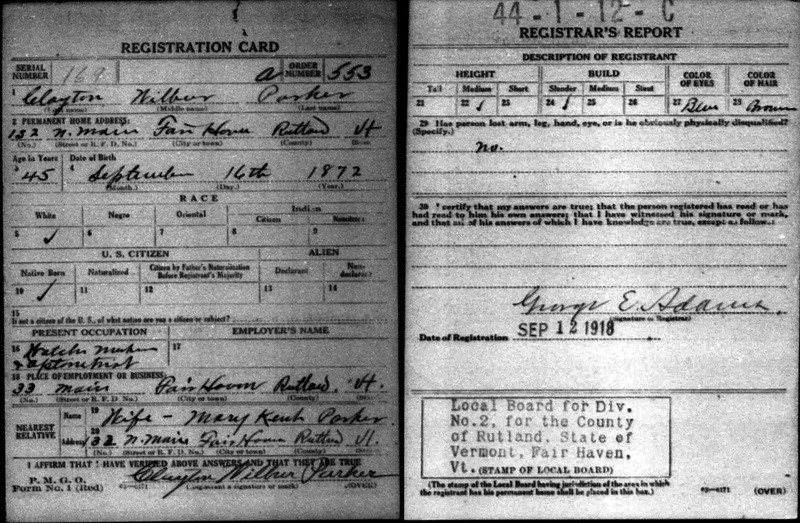 20, , at http://www.skidmoregenealogy.com/images/OccPap_no._20.pdf . Deloraine P. Corey, Births, Marriages, and Deaths in the Town of Malden, Massachusetts 1649-1850, Cambridge: University Press, (1903) , p. 366. 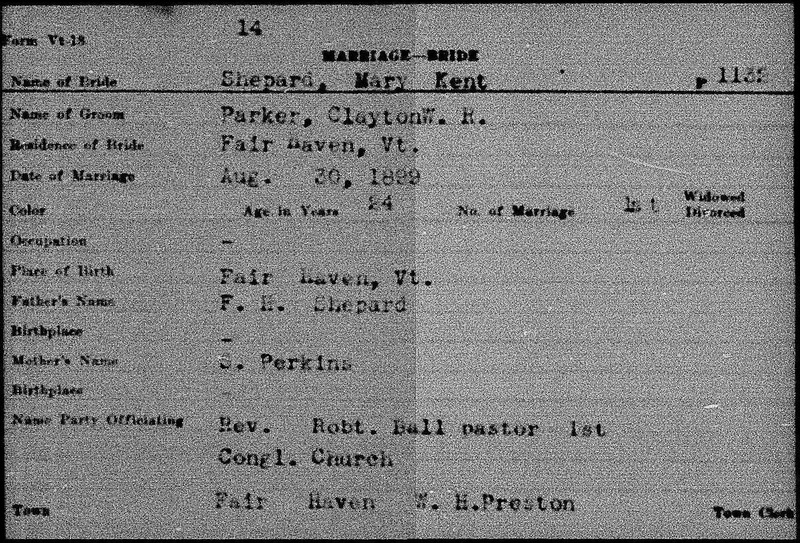 Deloraine P. Corey, Births, Marriages, and Deaths in the Town of Malden, Massachusetts 1649-1850, Cambridge: University Press, (1903) , p. 63. Thomas W. Baldwin, Vital Records of Cambridge, Massachusetts, to the year 1850, Boston: Wright & Potter Print. Co., (1914) , Vol. 2, p. 295. Deloraine P. Corey, Births, Marriages, and Deaths in the Town of Malden, Massachusetts 1649-1850, Cambridge: University Press, (1903) , p. 367. Deloraine P. Corey, Births, Marriages, and Deaths in the Town of Malden, Massachusetts 1649-1850, Cambridge: University Press, (1903) , p. 366. Grave shows age of five years. Darryll E. Paquette is online at https://www.facebook.com/darryll.paquette. 1880 United States. Bureau of the Census. 10th census, Vermont, 1880 federal census : soundex and population schedules, Washington, D.C.: The National Archives,, ([19--?]) 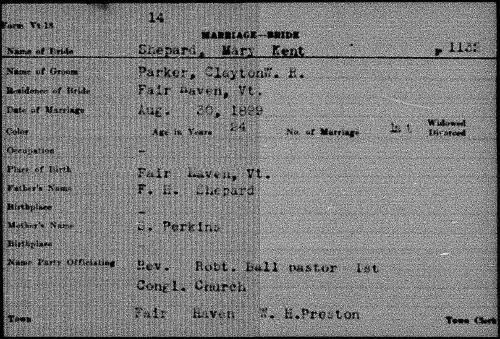 , FHL Film 1255347; National Archives Film T9-1347; Page 126D. 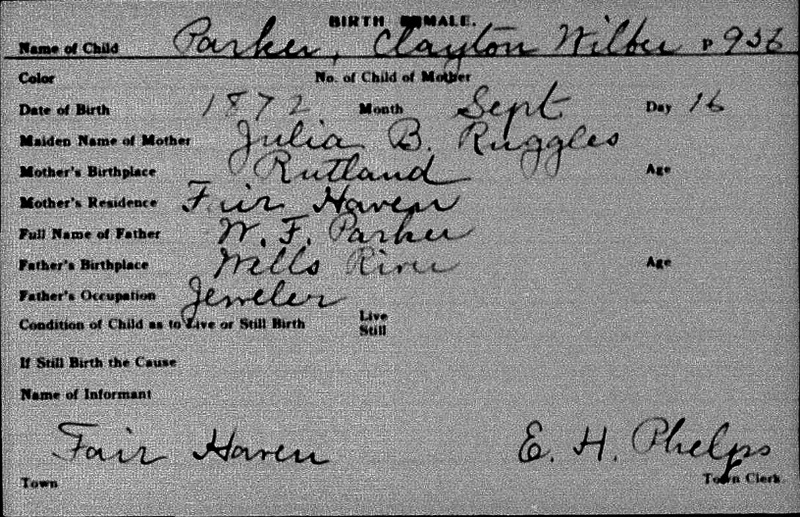 "Vermont, Vital Records, 1760-1954," database with images, FamilySearch (https://familysearch.org/ark:/61903/1:1:XFWP-7JP : accessed 14 August 2015), Clayton Wilber Parker, 16 Sep 1872, Birth; State Capitol Building, Montpelier; FHL microfilm 540,129. 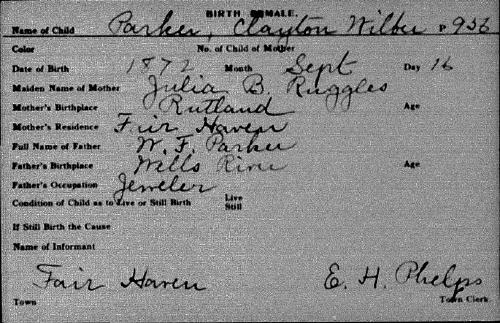 "Vermont, Vital Records, 1760-2008," database with images, FamilySearch (https://familysearch.org/ark:/61903/1:1:KFRD-ZVM : accessed 15 August 2015), Clayton Wilbur Parker, Death, 15 Jan 1952, Fair Haven, Rutland, Vermont, United States; derived from Vermont birth, marriage, and death databases and images, 1909-2008, Ancestry (http://www.ancestry.com : 2010); citing Vital Records Office, Vermont Department of Health, Burlington; New England Historic Genealogical Society, Boston.